fresh-pressed apple cider, fall squash and gourds, harvest and Halloween decorations, farm animals and a corn bin to play in! Walk-in hayrides are only on weekends in the month of October from 11am to 4pm. 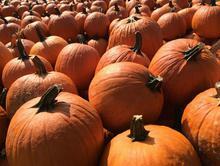 Rides to the pumpkin patch cost $3.00 per person – children 3 years old and younger ride free! The duration of the ride is approximately 20 minutes. We sell pumpkins of all sizes - tiny and outrageously huge! You can pick from the pumpkins in our shop or out in the patch. Take our tractor hayride out to the pumpkin patch and pick the perfect pumpkin to carve up or decorate! We sell a variety of apples grown locally in Winchester, Virginia. Nothing tastes as fresh as a Winchester apple in the Fall! 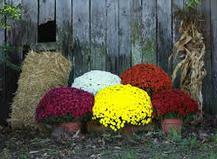 Our chrysanthemums bloom in September and October and brighten up any yard. All of our Fall and Halloween decorations are handmade by a local artist! Reserve Your Spot Now For Group Activities! 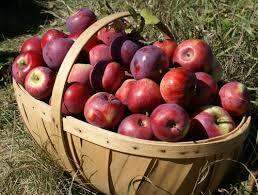 Includes a hayride, apple and fresh local cider. 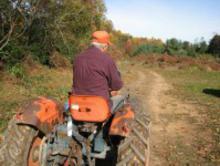 Includes a hayride, apples, fresh local cider and a small pumpkin. Includes a hayride and campfire. We are currently taking reservations for group hayrides and campfires. Please email lkrop@hotmail.com with questions.